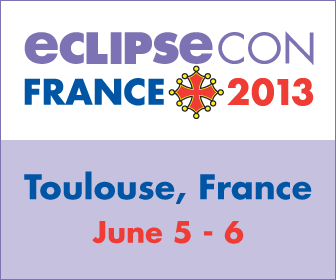 EclipseCon France is coming soon to Toulouse on June 5-6. Member companies have an opportunity to be a sponsor for the first-ever EclipseCon to emphasize modeling, systems engineering, and technologies related to the Internet of Things. Send in your talk proposal now; submission deadline is April 15. If you want your talk selected early and featured on the website, submit by the early-bird deadline on April 8. Register now for the best price; check the website for more information about prices and discounts. The Eclipse community recently elected three Committer representatives and three Sustaining Member representatives to the Board of Directors. Committer reps are Chris Aniszczyk, John Arthorne, and Ed Merks. Sustaining member reps are Christian Dupuis, Hans Kamutzki, and Mik Kersten. Congratulations to all, and thanks for everyone who participated in the 2013 Board elections. Award winners were announced at EclipseCon Boston between rounds of the Code Recommenders game. The Top Committer award went to Markus Knauer, and the top Newcomer Evangelist Award went to Jonas Helming. Chris Aniszczyk received the Lifetime Achievement award. The Kepler Simultaneous Release arrives soon, so that means it's DemoCamp time! Sign up now to organize an event in your city during June. The Eclipse 2013 Spring Training series will run May 20 - June 28 this year. Watch for more information in next month's Member Newsletter. Sirius aims at providing specific multi-view workbenches through graphical, table or tree modeling editors. Add a wireframing tool to your toolbox! Use ECLIPSE coupon for a 10% discount.